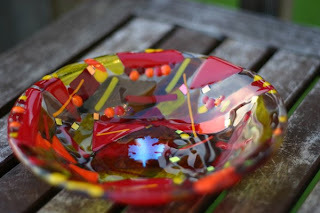 As a birthday present, Paul bought me a Fused Glass Bowl class at the Sawtooth Center. The actual class was a couple of weeks ago, but the final firing was finished on Monday. I was extremely please with the final result. The theme was sort of planned around a piece of dichroic glass that was acid brushed to remove the coating everywhere except where the leaf was placed. I'm so ready for fall to get here that after deciding on the leaf, an autumnal theme was easy to compose.